Interlinear text of Hebrew Numbers 6.3–10 with Aramaic Targum Onkelos from the British Library. Targum Onkelos (or Onqelos), תרגום אונקלוס, is the Jewish Babylonian Aramaic targum ("translation") of the Torah. However, its early origins may have been Western, in Israel. 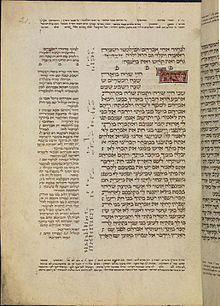 Its authorship is attributed to Onkelos, a famous convert to Judaism in Tannaic times (c. 35–120 CE). Some identify this translation as the work of Aquila of Sinope in an Aramaic translation (Zvi Hirsch Chajes), or believe that the name "Onkelos" originally referred to Aquila but was applied in error to the Aramaic instead of the Greek translation. In Talmudic times, readings from the Torah within the synagogues were rendered, verse-by-verse, into an Aramaic translation. To this day, the oldest surviving custom with respect to the Yemenite Jewish prayer-rite is the reading of the Torah and the Haftara with the Aramaic translation (in this case, Targum Onkelos for the Torah and Targum Jonathan ben 'Uzziel for the Haftarah). The Talmud states that "a person should complete his portions of scripture along with the community, reading the scripture twice and the targum once (Shnayim mikra ve-echad targum)." This passage is taken by many to refer to Targum Onkelos. The directive to read Targum Onkelos on the weekly portion is codified in Jewish Law. Onkelos' Aramaic translation of the Pentateuch (Five Books of Moses) is almost entirely a word-by-word, literal translation of the Hebrew Masoretic Text, with very little supplemental material in the form of aggadic paraphrase. However, where there are found difficult biblical passages, Onkelos seeks to minimize ambiguities and obscurities. He sometimes employs non-literal aggadic interpretations or expansions in his translated text, usually in those places where the original Hebrew is marked either by a Hebrew idiom, a homonym, or a metaphor, and could not be readily understood otherwise. The translator is unique in that he avoids any type of personification, or corporeality, with God, often replacing "human-like" characteristics representing God in the original Hebrew with words that convey a more remote and impersonal sense. For example, "my face" (Heb. panai) is replaced by "from before me" (Exodus 33:23), while "beneath his feet" is replaced by "under his throne of glory" (Exodus 24:10), and "The Lord came down upon Mount Sinai" by "The Lord manifested himself upon Mount Sinai" (Exodus 19:20). Samuel David Luzzatto suggests that the translation was originally meant for the "simple people". This view was strongly rebutted by Nathan Marcus Adler in his introduction to his commentary to Targum Onkelos Netinah La-Ger. He often updates the names of biblical nations, coinage and historical sites to the names known in his own post-biblical era. In matters of Halakha, the targum entirely agrees with Rabbi Akiva's opinions. Some authors suggest that Akiva provided for a revised text of the essential base of Targum Onkelos. (Genesis 2:7) (Aramaic: הות באדם לְרוּחַ מְמַלְלָא, in Hebrew characters) [= "...and it became in man a speaking spirit"], instead of "...and man became a living soul." (Genesis 3:5) (Aramaic: וּתְהוֹן כְּרַבְרְבִין, in Hebrew characters), [= "...and you shall be like potentates"], instead of "...and you shall be like gods." (Genesis 18:8) (Aramaic: וְהוּא מְשַׁמֵּשׁ עִלָּוֵיהוֹן תְּחוֹת אִילָנָא, in Hebrew characters), [= "...and he waited upon them under the tree, etc. "], instead of "...and he stood by them under the tree, etc." (Genesis 38:26) (Aramaic: וַאֲמַר זַכָּאָה, מִנִּי מְעַדְּיָא, in Hebrew characters), [= "...and he said, 'She is in the right. It is from me that she is pregnant', etc. "], instead of "...and he said, 'She has been more righteous than I', etc." (Exodus 1:8) (Aramaic: וְקָם מַלְכָּא חֲדַתָּא עַל מִצְרָיִם דְּלָא מְקַיּיֵם גְּזֵירַת יוֹסֵף, in Hebrew characters), [= "And there arose a new king in Egypt who did not fulfill Joseph’s decrees. "], instead of "And there arose a new king in Egypt who knew not Joseph." (Exodus 4:25) (Aramaic: וַאֲמַרַת בִּדְמָא דִּמְהוּלְתָּא הָדֵין אִתְיְהֵב חַתְנָא לַנָא, in Hebrew characters), [= "...and she said, 'By the blood of this circumcision the groomed infant has been given to us'." (i.e. the child was on the verge of dying until he was circumcised)], instead of "…and she said, 'Surely a bloody husband are you to me'." (Exodus 14:8) (Aramaic: וּבְנֵי יִשְׂרָאֵל נָפְקִין בְּרֵישׁ גְּלֵי, in Hebrew characters), [= "...and the children of Israel went out openly. "], instead of "...and the children of Israel went out with an high hand." (Exodus 23:19) (Aramaic: לָא תֵיכְלוּן בְּשַׂר בַּחֲלַב, in Hebrew characters), [= "...Do not eat flesh with milk. "], instead of "...You shall not seethe a kid [of the goats] in his mother's milk." (Numbers 15:15) (Aramaic: קְהָלָא קְיָמָא חַד לְכוֹן וּלְגִיּוֹרַיָּא דְּיִתְגַּיְּירוּן, in Hebrew characters), [= "One ordinance shall be both for you of the congregation, and also for the proselytes that sojourn with you"], instead of "...and also for the stranger that sojourns with you." (Numbers 12:1) (Aramaic: וּמַלֵּילַת מִרְיָם וְאַהֲרֹן בְּמֹשֶׁה עַל עֵיסַק אִתְּתָא שַׁפִּירְתָא דִּנְסֵיב אֲרֵי אִתְּתָא שַׁפִּירְתָא דִּנְסֵיב רַחֵיק, in Hebrew characters), [= "And Miriam and Aaron spoke out against Moses concerning the beautiful woman whom he took [in marriage], for the beautiful woman whom he had taken [in marriage] he had distanced (from himself). "], instead of "...spoke out against Moses concerning the Ethiopian woman whom he had married, etc." (Deuteronomy 20:19) (Aramaic: אֲרֵי לָא כֶאֱנָשָׁא אִילָן חַקְלָא לְמֵיעַל מִן קֳדָמָךְ בִּצְיָרָא, in Hebrew characters), [= "...for a tree of the field is not like unto man to remove himself from you during a siege. "], instead of "...for the tree of the field is man's life to employ them in the siege." ^ Ben Maimon, M. (1956). Guide for the Perplexed. Translated by Michael Friedländer (2nd ed.). New York: Dover Publishers. p. 14 (part 1, ch. 2). ^ Epiphanius' Treatise on Weights and Measures - The Syriac Version (ed. James Elmer Dean), University of Chicago Press 1935, p. 30, who writes that Aquila (known also as Onkelos), who was a relation of Hadrian, had been made the overseer of Jerusalem's rebuilding in around 115 CE. ^ Ben Maimon, M. (1956). Guide for the Perplexed. Translated by Michael Friedländer (2nd ed.). New York: Dover Publishers. p. 31 (part 1, ch. 21). ^ Ben Maimon, M. (1956). Guide for the Perplexed. Translated by Michael Friedländer (2nd ed.). New York: Dover Publishers. pp. 35–37 (part 1, chs. 27–28). ^ The literal words used in the Hebrew text are: "and you shall be like elohim." The word elohim, however, is a Hebrew homonym, having multiple meanings. It can mean either God, angels, judges, potentates (in the sense of "rulers" or "princes"), nobles, and gods (in the lower case). In most English translations of Genesis 3:5 it is rendered as "gods" (in the lower case), and which, according to Onkelos, is a mistranslation and should be translated as "potentates." ^ In accordance with a teaching in the Jerusalem Talmud (Nedarim 3:9 [13a]): "Rabban Shimon ben Gamliel said: May God forbid! The angel [of death] did not seek to kill Moses, but rather the infant!" Still, the matter is disputed, some holding that it was Moses, Zipporah's bridegroom, whom the angel of death sought to kill for not performing the circumcision on one of their sons, as relayed in the Palestinian Aramaic Targum. Mechon Mamre has the entire Aramaic text of Targum Onkelos with vowels according to Yemenite manuscripts. The Targum appears as digital text in two different user-friendly versions: (1) The Aramaic targum text with vowels can be viewed in its entirety on its own, either book-by-book or chapter by chapter. (2) The Aramaic targum can be viewed verse-by-verse parallel to the Hebrew text, within files that contain one weekly portion (parshat ha-shavua) at a time. The index to both versions is here; there is also an older version without vowels.